Visitors to Tunisia must obtain a visa from one of the Tunisian diplomatic missions unless they come from one of the visa exempt countries. 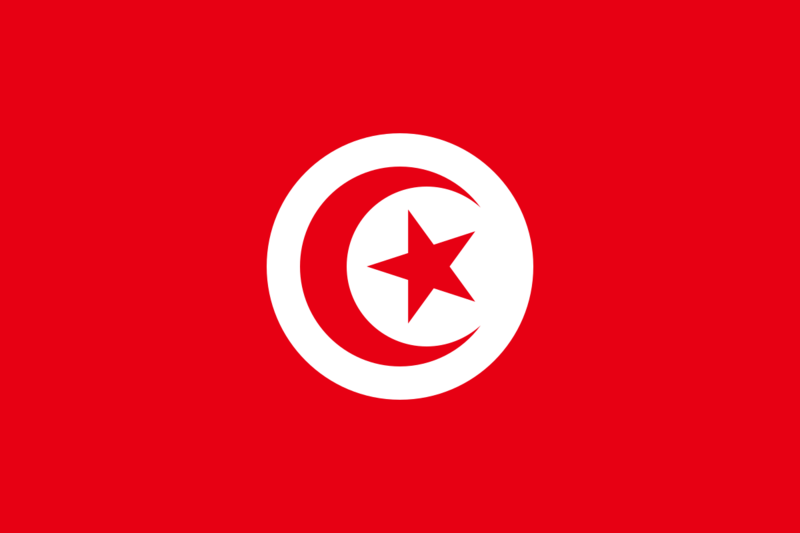 Visitors must hold passports that are valid for at least six months from the date of arrival to Tunisia. When entering with a vehicle, a traffic permit for the vehicle of three months is granted. The vehicle data is entered in the holder’s passport, as a sale of the vehicle in Tunisia may not take place without customs clearance. When leaving with the vehicle the entry will be deleted. Tunisia’s only official language is Arabic. Since almost the entire population speaks Tunisian Arabic and also dominates the written Arabic, among the Maghreb states, Tunisia is the most homogeneous country from a linguistic point of view. Tunisian Arabic is actually a mixture of dialects and is mainly used as everyday language. Only in the south of the country and on the island of Djerba, Berber dialects are still occasionally used. During the time of the French protectorate in Tunisia, the French language was introduced. Although the official reintroduction of the Arabic language took place after official independence, administration, justice and education remained bilingual for a long time. In the 1990s, however, French was pushed back from public life in Tunisia. Since October 1999, all business owners have been required to use at least twice as much space for Arabic than Latin characters in their advertising. The influence by tourists from Europe leads to, in addition to French, English increasingly being used as a lingua franca. For those who still want to learn a few words in Arabic or French, here is a small overview of the most important words and sentences. No, thanks! la shukran! لا شكرا Non, merci! Pardon? madha? نعم ؟ Pardon? Bye! maa salamah مع السلامة Au revoir! 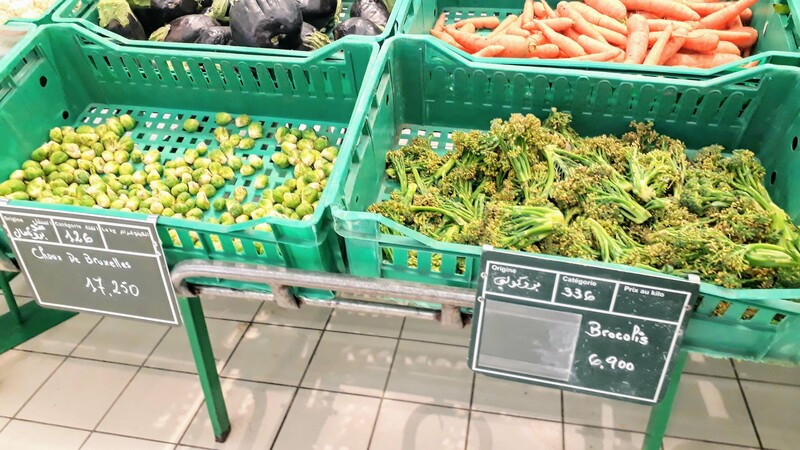 Although Tunisian cuisine is based on abundant olive oil and various vegetables, it is one of the vegan-unfriendliest countries we have been to. However, since we were only there for a package holiday with half board, we can not (yet) report that much. Unfortunately, in many parts of the country even vegetarianism is still unknown or misunderstood. So be prepared to always explain exactly what you don’t want in your food. As far as we know, there are no purely vegan restaurants in Tunisia. The national dish is couscous. You can get it in a vegan version with the appropriate order (with vegetables). Unfortunately, unlike in Morocco, Tunisian tagine is rarely vegan, as the dish is usually egg-based. But the popular ingredient Harissa is vegan. The red, hot spice paste made of red pepper, chili and olive oil is one of the most important ingredients of many dishes. Soy and other plant milk can be found in Carrefour, e.g. from the brand Don Simon. However, it is quite expensive: 1 liter costs about 3 US-dollar. The World Heritage in Tunisia includes eight UNESCO World Heritage Sites, including seven cultural and one natural heritage sites (Ichkeul National Park). We visited the medinas of Sousse and Tunis, the carthage excavations near Tunis and the amphitheater in El Djem. North of Carthage is the beautiful blue-and-white village of Sidi Bou Saïd. Other cities worth seeing are Mahdia, Monastir, Hammamet and the Medina Mediterranea in Yasmine Hammamet. On this map you get an overview of all interesting places in Tunisia. The places marked with a star belong to the UNESCO World Heritage. Here you will find an overview of all articles of Tunisa. 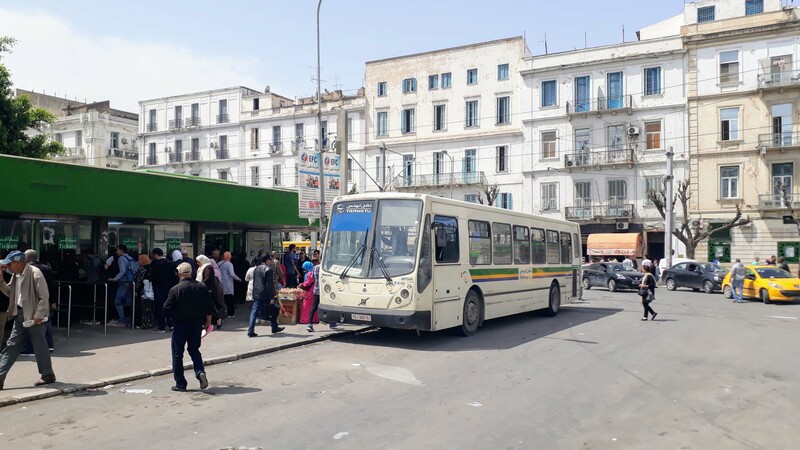 Tunisia is well connected by public transport. The national railway Société nationale des chemins de fer tunisiens (SNCFT for short) operates long-distance, local and freight transport by rail, as well as suburban transport in Tunis. In total, this results in 2167 kilometers (or 1347 miles) of track with 267 stations and stops. 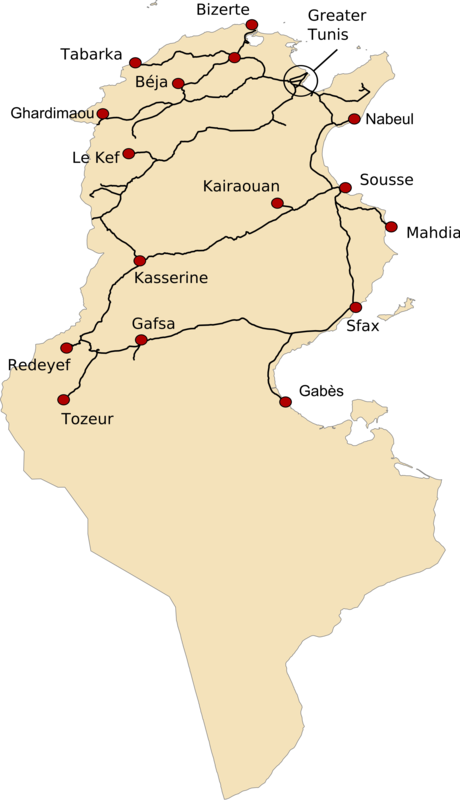 The most important route of the SNCFT is the Ligne de la Côte, which connects Tunis with Sfax. It is also the fastest-traveled meter gauge track worldwide. 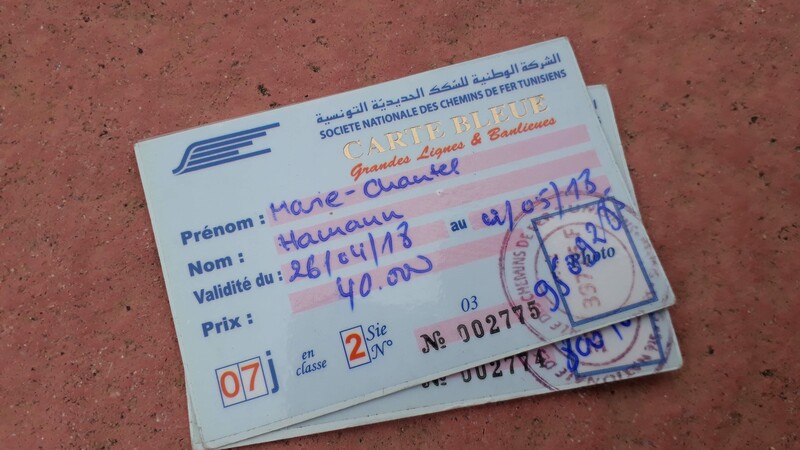 For tourists, SNCFT offers a railpass called Carte Bleue. 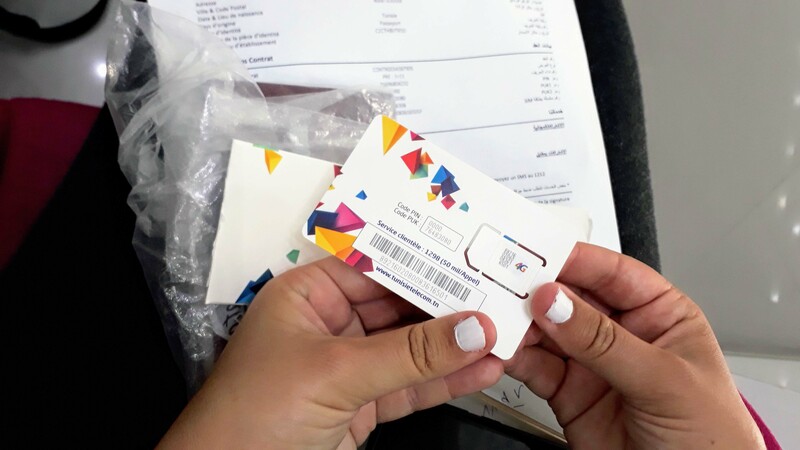 This pass is available for 7, 15 or 21 days for each of the 3 classes, depending on the class and period of validity, the price is the equivalent of around 10 to 90 US-dollar. For all air-conditioned trains a surcharge is to be paid (seat reservation included); depending on the class and distance, it costs from 0.15 dinars to 1.50 dinars. The Carte Bleue is not transferable and is only available upon presentation of the passport and a passport photo. We paid 40 TND (about 14 dollar) per person for 7 days in 2nd class. 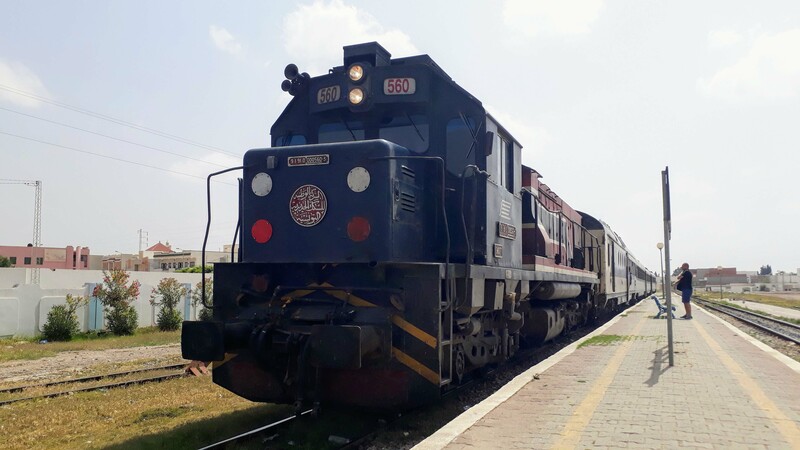 The surcharge for the express train from Sousse to Tunis was 3.70 dinars, the train reservation for the “normal” train from Tunis to Souse 1 TND. From Sousse to El Djem the train reservation cost 0.80 dinars. Shared taxis, called Louage in Tunisia, are minibuses with up to 9 seats that run several times a day between localities. In every major city there is a Louage station (Station de Louages), often even with signposted “platforms”. The vehicles themselves can be recognized by their white color with red stripe on the sides. At their endpoints, they wait until all seats are filled. Then they follow their more or less fixed route, whereby the passengers can get on and off at any time. The fares for shared taxis in Tunisia are fixed (and shown in many cars in Arabic script) and very low. Routes within a city cost the equivalent of well under one dollar. To avoid later discussion as a tourist, you should first ask the driver or other passengers for the price. The respective fare must be paid as exact as possible to the driver before exiting. Louages ​​can also be completely “rented” by paying at a terminus for all seats. The national bus company Société Nationale du Transport Interurban (SNTRI for short) operates bus services connecting Tunis with most Tunisian cities. The buses are most equipped with air conditioning. 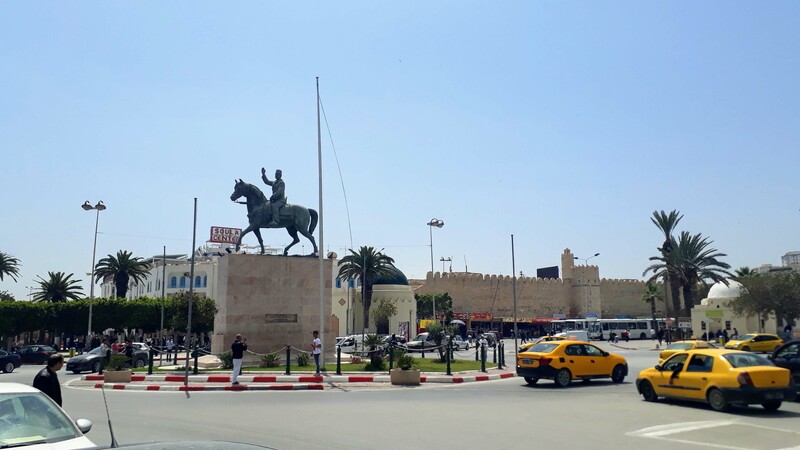 The journey time between Tunis and Sousse is about 2 hours. Private bus lines also go to smaller places. All buses are very cheap and relatively comfortable to the European ratio. In the larger cities, there are also urban bus lines. Bus stops in Tunisia are usually not recognizable from afar, but are only indicated by a nondescript bus shelter without price or schedule information. However, getting in and out is often possible between stops. You pay as you board (always in the back!) to the conductor sitting in the bus. The prices for city buses are low: 3 miles cost about 1.60 TND. In the capital, Tunis, there are not only buses but also trams in public transport. With the suburban train line TGM you also get to the surrounding villages La Goulette, Carthage, Sidi Bou Saïd and La Marsa. From Tunis you have to take the metro line 4 to the terminus Tunis Marine and then change to the TGM. The combined ticket for Metro and TGM costs 1.90 dinars. The TGM runs in high frequency from 3:30 in the morning until 0:30 in the night. The railway company SNCFT also operates the Métro du Sahel suburban railway along the Mediterranean coast. It connects Sousse via Monastir with Mahdia. The total travel time is 100 minutes and the whole distance from Sousse to Mahdia (or vice versa) costs 2.50 TND. As in New York City, the taxis in Tunisia are yellow and equipped with a taximeter. This has to be turned on when having a passenger, so you should definitely insist on it, also because of the low fares. From about 21 clock the night rate (about 50% higher than the daily rate) is used. In tourist areas Tunisian taxi drivers sometimes try to get more money with some tricks (for example, using the night rate during the day, insisting on higher fixed prices or calculating any alleged “special services”). Women traveling on their own are advised to always enter in the back. We only went once in Sousse 2.5 kilometers by taxi. Since everything went well, the driver did not try to pull us off, we gave the taximeter price of 1.50 TND and another 1.50 dinars tip on top. Tunisia is relatively small compared to other African countries, but there are noticeable differences in temperature and precipitation between the different Tunisian regions. Because this is where Mediterranean and arid desert climate meet. While the north is humid in winter and dry in summer, and the central Tunisian steppe region is characterized by a changeable climate with hot summers and cold winters, the Mediterranean influenced by the sea has a more balanced climate, as does the region south of the Chott el Djerid with its desert climate. Precipitation falls almost exclusively in the winter months, decreasing from north to south and increasing slightly from east to west. In Tunis, temperatures are 10 degrees Celsius (50 degrees Fahrenheit) in January and 26 degrees Celsius (79 degrees Fahrenheit) in August. South of the Atlas, there is a year-round dry desert climate with very irregular rainfall. The temperatures here reach maximum values up to 45 degrees Celsius (113 degrees Fahrenheit), whereby it can come to 10 degrees temperature difference in the shade. The most extreme differences are reached in the Sahara with summer temperatures of 50 degrees Celsius (122 degrees Fahrenheit) and ground frosts in winter. The wind from the Sahara, in Tunisia called Chehili, regularly causes great heat. For a beach holiday on the Tunisian coast, the summer months are suitable: There is hardly any precipitation and the Mediterranean usually ensures pleasant daytime temperatures. For round trips and desert tours, however, it’s best to choose spring or autumn months. During this time it is not so hot during the day and not so cool at night. Equality between women and men is an important issue in the constitution. 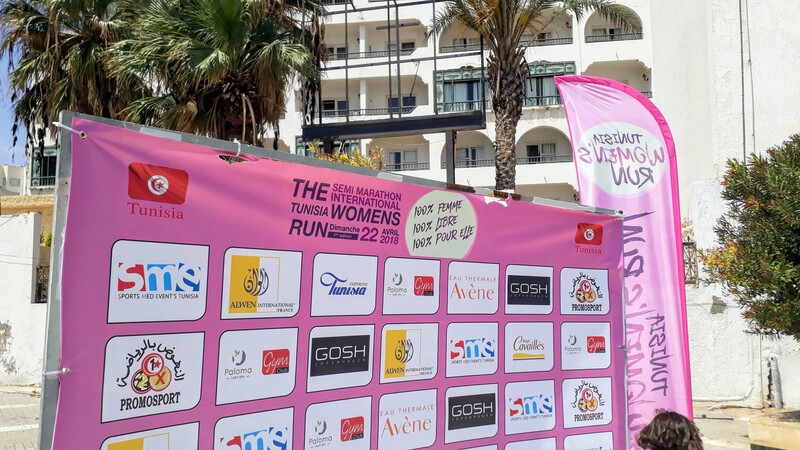 Since the mid-1950s, promoting women has been part of Tunisian politics. Thus, after the independence of Tunisia in 1956, women were broadly equated: they were given the right to vote and have since been able to file for divorce. Not only do the new articles 20 and 45 make men and women completely equal and guarantee equal opportunities, they are also in favor of giving women a certain number of seats in city councils and district councils. Unfortunately, Islamic inheritance law, in which sons earn a higher share than daughters, is still maintained. So, despite all state efforts, there is still discrimination against women. As in all Islamic countries, the prayer time is called 5 times a day. 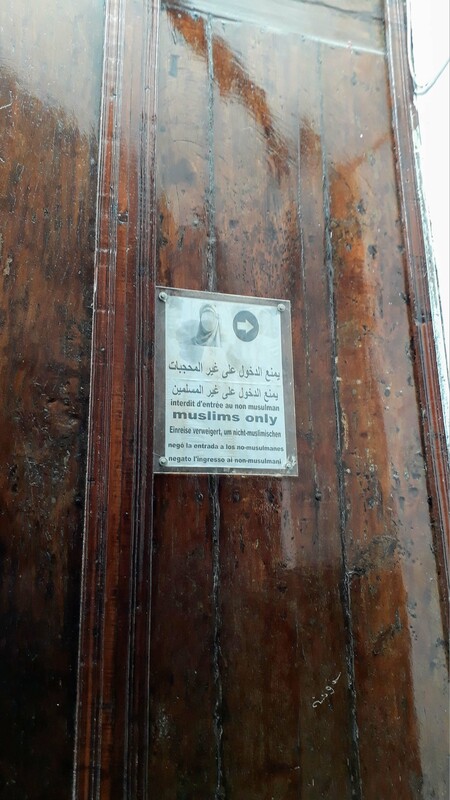 Most mosques, however, are only accessible to Muslims. In Tunisia you pay with the Tunisian Dinar (short: TND or DT). A dinar is divided into 1000 millièmes. Currently (as of 11/2018) 1 Tunisian Dinar is equal to 0.34 US-dollar or 1 US-dollar to 2.90 Tunisian Dinar. 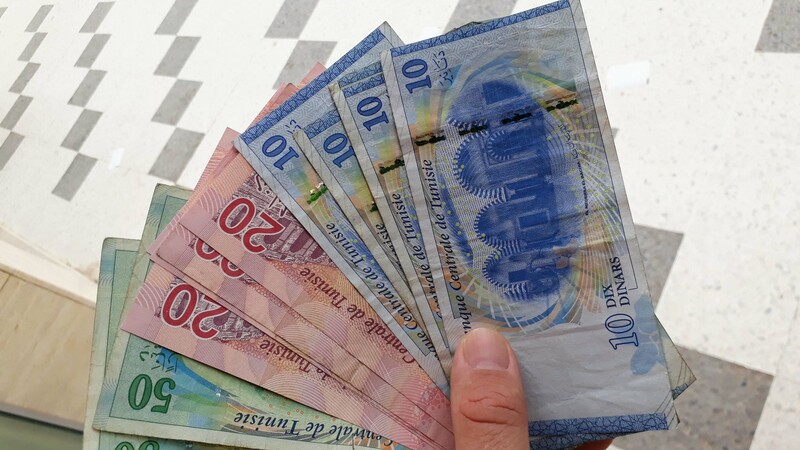 There are banknotes of 5, 10, 20 and 50 dinars and coins of 1/2, 1, 2 and 5 dinars as well as 1, 2, 5, 10, 20, 50, 100 and 200 millièmes. Millième coins below 100 will hardly be seen. Don’t forget to take your passport! 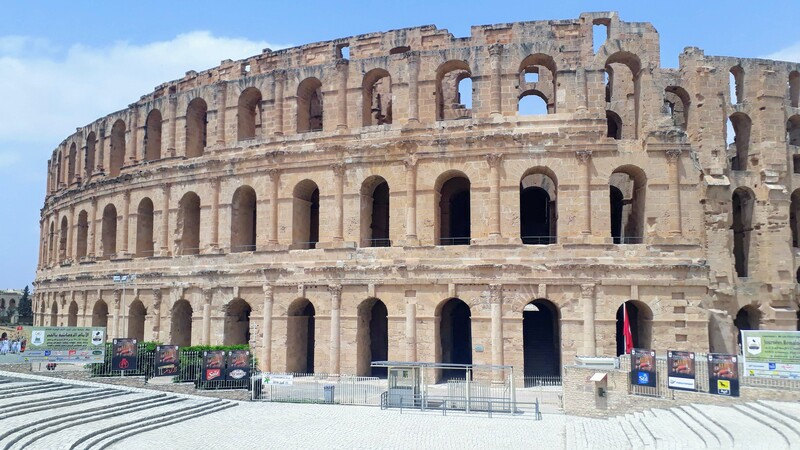 As already mentioned in some travelogs, with the international student card ISIC you can get in most attractions in Tunisia completely for free. You can order the ID card online for a fee.